When warm weather rolls around, finding the right sandal for every member of the family is essential. Wearing a sandal doesn’t mean you have to sacrifice the support, quality, comfort provided in a traditional shoe. Warm weather means outdoor and water activities. It’s necessary to find a sandal that can function in numerous ways, such as for walking and hiking, and can withstand a variety of terrains, like the beach or rocky mountain terrain. Comfort and breathability are also important factors in selecting the best sandal for your foot needs. No one wants blisters or sweaty, smelly feet, especially if you plan on wearing your sandals for an extended period of time. Durability and quality are imperative for getting the best value for your dollar. The goal should be to find sandals that will last for years rather than just for the summer. Listed below is a selection of the best men and women’s sandals with high quality crafting, supportive insoles, and tough, durable soles. With a cult following from runners, cyclists, and other athletes, the OOFOS brand is known for their recovery-aimed shoe designs. The OOFOS Unisex Slide Sandal is a simple waterproof sandal designed to maximize comfort with strong arch support and impeccable impact absorption. With its easy slide-on design, these sandals are perfect to wear after a tough workout to help with recovery. The OOFOS Slide Sandal is also ideal for individuals with sensitive foot injuries. The breakthrough patented oofoam textured foot bed and instep support cushions the foot to soften the impact of daily activities, providing 37% more impact absorption than the leading performance shoes. This can make everyday activities, such as walking or standing long periods of time, less painful for those suffering from foot injuries. The OOFOS Slide Sandals are lightweight making them a great shoe for summer and warm climates. Because of the slide design, the sandals can be worn in the winter with socks as well. Due to the rubber material the slides are made with, buyers might want to order a size smaller because over time the sandal will stretch and mold to your feet. The OOFOS Slide Sandal comes in three colors—black, navy, and white. The Agowoo brand makes high quality leather sandals that are casual and can go with any outfit. The Agowoo Women’s Ankle Strap Beach Hiking Sandal is a casual leather sandal ideal for outdoor activities, such as walking and hiking. The durable design of hook and loop closures with Velcro leather straps makes them long lasting, even with frequent wear. The Velcro straps make the sandals adjustable, so the fit can be customized. The sandals’ synthetic soft sole is made to withstand the shock of running, jumping, and other high-impact activities. Their high-impact design makes these sandals ideal for individuals with foot injuries and pain, who still want to be active and explore the outdoors. While the sandals have a thick sole, they are surprisingly lightweight, making them comfortable to wear for a long period of time. The sandals come in the colors khaki, green, and brown. The Agowoo Women’s Lace Up Hook and Loop Sandals are designed to provide comfort while enjoying outdoor activities, such as walking and hiking. They provide so much comfort that one Amazon reviewer even compared them to wearing her bedroom slippers in public. Another reviewer said that these sandals fit like a glove. The sandals’ soles have a nice grip that’s specially equipped to combat difficult terrain, such as sand. The closed-toe design helps to protect toes from loose material and rocks during more intense outdoor activities. The sandal’s straps are constructed from durable leather and the soles from tough rubber, giving these sandals a longer lifespan. The leather design also makes it easy to wipe the sandals clean. The sandals, with their thick rubber soles, are also great for people with foot injuries or chronic foot pain. The soles are designed to eliminate the shock from running and jumping by absorbing it. The Agowoo Women’s Lace Up Hook and Loop Sandals are available in three colors—brown, green, and khaki. Viakix claims to be America’s Best Water Shoe brand and takes pride in their shoes’ ultimate versatility, ultra comfort, and modern design. The Viakix Womens Sport Sandals are “adventure ready” and make it easy to explore the outdoors while still being fashionable. With their stylish design, these sandals can be worn while casually strolling around town or while exploring rough terrain, such as the sharp surface of a reef. Crafted for comfort and durability, the Viakix Sport Sandals have a supportive insole and water-resistant webbing. These shoes are quick drying, so they can easily transition from water to land activities. They also have multiple narrow Velcro straps, ensuring that your sandal can be adjusted to fit perfectly. The sandal’s lightweight mimics the feeling of being barefoot, making them ideal for long-term wear. The sandals come in four colors—black, grey, blue, and rose. The unique pattern on the straps and the variety of colors makes these sandals versatile and trendy, able to work with a sundress or a pair of shorts. Camel Sandals is a family-owned brand that utilizes a combination of “Old World style” and clean modern design. Camel Sandals is an internationally recognized brand that’s sold in many countries around the world, such as the United States, Italy, Poland, and Japan. The Camel’s Men Casual Cow Leather Sandals are crafted with quality and built to last. The upper part of the sandal is made from durable cow leather imported from Italy and the outsole is made from polysynthetic leather. This attractive sandal can function on the beach or in a more formal setting with the versatile back strap that can be worn down or flipped up to create two different looks and fits. The sandal lining is man-made and the strap design is meant to be breathable. The sole has excellent grip and is slip resistant. The Camel’s Men Casual Cow Leather Sandals come in brown and black, and all leather is hand-dyed. The Vocni brand designs classic, fashionable clothing pieces and shoes for men and women that are high quality and long lasting. The Vocni Men’s Open Toe Casual Leather Comfort Sandals are designed to sporty, fashionable, and functional. Crafted from premium genuine leather, the sandal has a sleek design with crossing straps that ensures full foot support and comfort. The sandal features a stretch underlay to ensure the best fit possible. The sandal also has a lacing system with quick-dry bungees so it fits snug and stays in place. The sandal’s insole has a unique massage design for easing foot pain. The Open Toe Comfort Sandals reduce odor from sweat with a quick drying lining and an odor-resistant rubber outsole. The sandal has two looks that are created with the versatile back strap. The strap can be worn down for a traditional sandal or flipped up to create a slide/flip flop look. The Vocni Men’s Open Toe Sandal is available in three colors—black, brown, and yellow brown. The Camel Men’s Cow Leather Altamont Performance Closed Toe Sandals are classic fisherman sandals crafted with high quality. Camel meticulously builds their sandals by combining modern machinery with the tradition of handmade artisanship. These hypoallergenic sandals are ideal for warm weather and are comfortable to be worn all day, even while taking long walks. The sandal’s upper straps are made of cow leather from Italy, and the outsole is made of polysynthetic leather, making them durable and long lasting even with frequent wears. The sandals are lined with a thin microfiber lining to help with breathability and comfort. The Camel Closed Toe Sandals feature aesthetically pleasing topstitching designs on the joints of the straps and adjustable hook-and-loop Velcro straps to ensure a proper fit. The sandals come in two hand-dyed colors—khaki and brown. 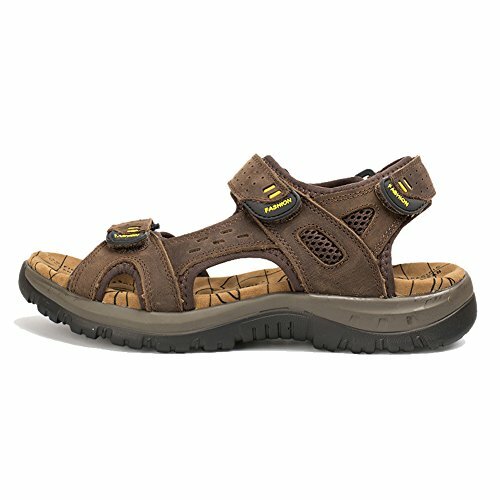 The Agowoo Men’s Leather Ventilated Hiking Beach Sandals are high functioning sandals designed for active individuals. The sandal is crafted with quality leather and a durable synthetic sole perfect for walking, hiking, and other outdoor use. The sole is designed to absorb shock, which eliminates pain from running or jumping. Even individuals with foot injuries or pain will find these sandals comfortable for long-term wear. The hook and loop straps are adjustable to ensure the best fit for your foot. The strap layout is designed to maximized air circulation improving the sandal’s breathability. The Agowoo’s Mean Leather Hiking Beach Sandals are available in three different colors—brown, khaki, and green.